Tobacco is a leading cause of death among Asian Americans, Native Hawaiians, and Pacific Islanders (AANHPI) and after two decades of work fighting the ravages of tobacco in our communities, Asian Pacific Partners for Empowerment, Advocacy, and Leadership (APPEAL), welcomes the State Health Officer’s Report on the dangers of E-Cigarettes announced Wed., Jan. 28, by the California Department of Health. The state joins 74 cities and counties throughout California that, in 2014, recognized the threat of e-cigs and implemented policies to protect their residents. “This afternoon’s press conference, held by the California Tobacco Control Program and California Department of Health, makes clear that e-cigarettes pose a threat to the health of our communities. We at APPEAL welcome the state’s clarity and its decision to issue a health advisory to medical practitioners altering them to the threat,” said Rod Lew, founding executive director of APPEAL. At the heart of the report are startling numbers. For the first time ever, national data showed that among U.S. teens, use of e-cigarettes actually surpassed the use of traditional cigarettes in 2014. 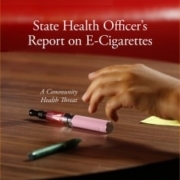 The State Health Officer’s Report included preliminary data from the California Healthy Kids Survey of more than 430,000 middle and high schools students that reflected this same trend- 6% of 7th graders use e-cigarettes vs. 2% smoke traditional cigarettes; 12% of 9th graders use e-cigarettes vs. 4% smoke traditional cigarettes; and 14% of 11th graders use e-cigarettes vs. 6.8% smoke traditional cigarettes. In all instances, the e-cigarette use is much higher than use of traditional cigarettes. The impacts on AANHPI communities appear to be even more shocking. Preliminary data from a 2014 survey of Asian and Pacific Islanders between 18 and 25 years old in California show that while 8% of respondents currently smoke traditional cigarettes, 17% currently use electronic nicotine delivery systems (ENDS), like e-cigs and e-hookahs, with that number jumping to 22% among male respondents. “We at APPEAL strongly believe that e-cigs are a new way to deliver the same additive drug – nicotine — that allows Big Tobacco to dodge regulations enacted to protect our communities and our youth from death and disease,” said Lew. One of APPEAL’s key missions is to protect our communities and, in particular, the next generation from a lifetime of nicotine addiction. In spite of claims by those who sell e-cigs that their products provide help in quitting the use of tobacco products, the state report points out that there is no scientific evidence that e-cigarettes help smokers successfully quit traditional cigarettes. In addition, dual use of cigarettes and e-cigarettes is continuing to rise, which may diminish any potential benefits of cutting back on traditional cigarettes. People wanting to quit should use cessation resources offered by their health insurance plan including access to FDA-approved cessation aids. The California Smokers’ Helpline at 1-800-NO BUTTS is a free, effective resource available to all Californians wanting to quit any and all tobacco products, including e-cigarettes. The California Smokers’ Helpline provides services in English, Spanish, Mandarin, Cantonese, Korean, and Vietnamese. Ultimately, nicotine is an additive substance that provides no benefit and is associated historically with considerable adverse impacts on health. Decades of work, millions of dollars, and literally millions of deaths have been invested in fighting the impact that tobacco and nicotine have had on AANHPI communities. We strongly oppose products that threaten to undo that investment and applaud the California Department of Health and California Tobacco Control Program for providing clear and important information on the subject. Tobacco is the #1 preventable cause of disease, disability, and death among Asian Americans and Pacific Islanders (AAPIs) and is associated with the top three killers of AAPIs – heart disease, cancer, and stroke. Even as the nation as a whole prepares for the Great American Smokeout coming up on November 20, many AAPI subgroups (Chinese, Filipino, Cambodian, Korean, Lao, Vietnamese, and others) face disproportionate rates of tobacco use and associated health impacts. So, APPEAL’s RAISE Network is re-branding the mainstream Great American Smokeout (Nov. 20) as the Great Asian American Smokeout. Please join in by snapping a photo of yourself making the face that best shows your feelings about smoking and post it to #RAISEwellness and #GreatAmericanSmokeout on Instagram, Twitter, and Facebook. Find out more on the Great Asian American Smokeout page!